It’s now time to apply the final lacquer coat to the Sakura, which means a final fit test is in order. This procedure allows me to check all the clearances and alignments of the hardware without the danger of damaging the final finish. I also don’t want to compromise the engraved pieces. These parts took nine months to be engraved by hand, and I absolutely want everything to fit. Everything seems to fit fine with just the right amount of clearance for the last thin coat. I’ve decided to go with a lower gloss vintage style nitro to alow the brilliance of the metalwork to come forward visually. This will be achieved by adding a flattening additive to the nitrocellulose lacquer before spraying. Every time I unwrap the engraved parts they bowl me over with their fabulous detail. I only wish that these photos could reveal the depth of the work that is visible in person. The cherry blossom petals are adorned with real rose gold and the leaves are green gold. At the very top of the picture a 24k yellow gold sun rises through the clouds. The entire plate background is finished in brushed nickel. Now it’s time to get into the paint room and get on with the program. I’ve spent a lot of my life cutting corners. Carrying two bags of groceries at a time to save steps, or taking a back street to clip a few precious seconds off a trip to the store. We all do it. My hobby is racing sports cars—the ultimate corner cutting exercise. At age thirteen I devised jigs and fixtures to hold brass tubing in place while soldering them into slot-car chassis to be sold at a local hobby store. A succession of factory jobs building things like film inspection machines, splicers, mechanical scales and grain moisture testers introduced me to the big-time of cost-cutting time management. Even my promotion to purchasing agent at nineteen taught me the ideas of maintaining a lean inventory and shaving pennies off an order. Later, my studies with Japanese Kaizen gurus Yoshihisa Doi and Hajime Oba took this to an even higher level. You might say it’s in my blood to look for a better, faster, cheaper way. When I first set up shop as a guitar maker, those same skills helped to fashion jigs and fixtures that kept things consistent and maintained an orderly flow. My training had also taught me to seek help and insight from those more experienced than myself. So, in 1980, while setting up the Hamer guitar factory in Illinois I invited a visit from Stan Rendell, former President of Gibson Guitars. As he looked around, Rendell pointed out places where money and time could be saved without upsetting the customer. 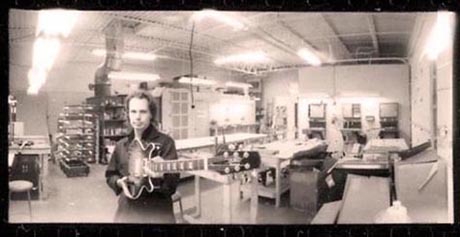 He mentioned that he could help whittle the time it took to make a complete guitar to under eight man-hours. I was horrified. The changes he suggested would certainly have reduced manufacturing time, but not without consequence. It became clear that the modern world had shifted its focus from improvement and consistency, to reducing cost without affecting customer perception. Today, I’m beginning my second day of testing pickups for the Sakura guitar. Every build goes through this process because every guitar is different and unique. From experience, it’s easy to whittle down the choices before I even begin. Still there are variables that only ear testing can address. I have a test rig that holds a pickup in place under strings to give me a baseline along with measuring the impedance and inductance. Because the Sakura guitar has steel plates on both front and back, the inductance will be important. Still, the final ear testing in the guitar will be the final exam. When I talk to people about what I do, the thing that always surprises them the most is how much time it takes. In a one-click world where the emphasis is continually on saving time and cutting costs, this kind of patient work is almost viewed as quaint. 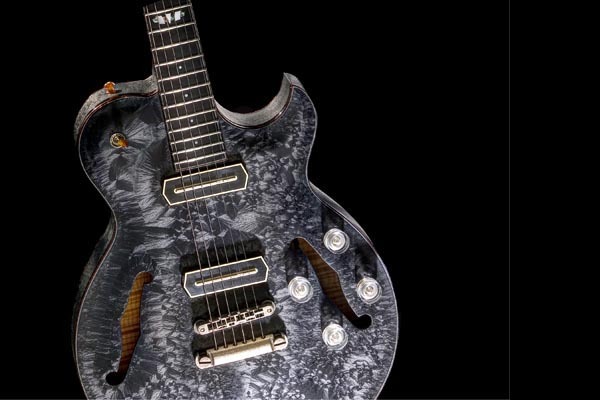 I could just put a pickup that was deemed “good enough” in the guitar and assume that the customer will change it out anyway. But that would be a waste of my skills. I just remind folks that I’ve already cut enough corners for several lifetimes. 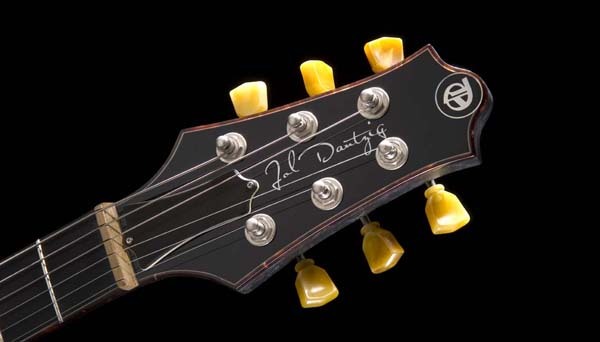 A while ago I wrote about how my headstock design came about. I was reading a book called In Small Things Forgotten: The Archaology of Early American Life, by James Deetz. The book is a study of the archeological history of early America (or New England) which is where I currently reside. Chapter four entitled Remember Me as You Pass By outlines the evolution of headstones carved in Connecticut and Massachusetts in the period between 1715 and 1829. I was struck by the author’s description of how the symbolism used on headstones changed in step with society’s evolving ideology and notions about life, death and the hereafter. The gravestones begin as simple markers with warnings about death, transitioning to the memorials that we are more familiar with today. The inscriptions begin to refer to the “earthly remains” alluding to the idea of a soul or afterlife being separate from the buried husk. It is interesting to note that society’s concept of the human being’s place in the universe is not static. Even today, despite our “modern” scientific arrogance, we are still evolving our understanding of what it is to be alive. Yesterday, my casual glance came across the book. I was reminded of my earlier post and the way that chapter influenced my design. It was a gorgeous day so I decided to take a field trip to one of the early graveyards mentioned in the book. Sandwiched behind a freeway entrance ramp and a dead end street, I found New London’s “Ancientest Bone Orchard” quiet and almost forgotten. I made my way around looking at the stonework and reading inscriptions. Just as I’d hoped, I found examples of exactly what I’d read about. This is an early example—a winged death’s head. Note the row of scary teeth and blank eyes. Certainly a grisly warning about the end of the line. Next is a transitional winged skull. The bottom of the nose resembles a frown as the teeth become less evident as well. Another skull sports crossed bones and a very prominent frown. The teeth have migrated to the bottom and appear almost as a collar. Finally, surrounded by urns and flowers, the cherubs and angels appear around 1860. These headstones clearly are memorials as opposed to just body markers. The upturned wings, eyes and mouths signify a happier ending than the death’s heads of just half a century before. Although tramping around in a three hundred year old cemetery isn’t my usual idea of a picnic, I was thrilled to witness the actual articles in the Deetz book. It was a sobering reminder of the transience of life. As I read the inscriptions I couldn’t help but to think of the families who have grieved at their loss. I said a few words—a kind of haiku—and moved along home. Even though the shape of my headstock isn’t exactly the same as the headstones that helped to inspire it—I’m still hoping that it too will be remembered as people pass by. 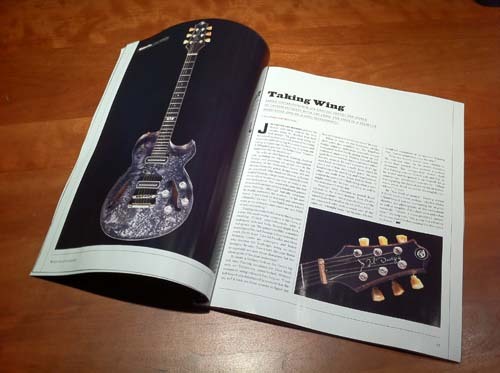 Many thanks to the great people at Guitar Aficionado for featuring The Crow in the new (July/August issue). The Rick Whittey photo sessions were rewarded handsomely with super-fine printing and a full page size—right up front in the book. Writer Adam Perlmutter’s words capture the essence of the build, nailing philosophy and circumstance behind it all. Somehow it is both perfect and pretentious at the same time. I even managed to slip in the word “schmuck” when talking about marketing guys—although it actually might have been something stronger. Go ahead, buy the issue and brush up on your wine and cheese repertoire while perusing photos of Kirk Hammett’s crib in Hawaii. If you’re feeling oh-so-rebellious—steal it. The early morning is a great time to walk in the woods and clear your thoughts. Each day I carve out some time to just be outside and enjoy the quiet. Today it was raining lightly and a fog was hanging in the trees, making it look even more amazing. 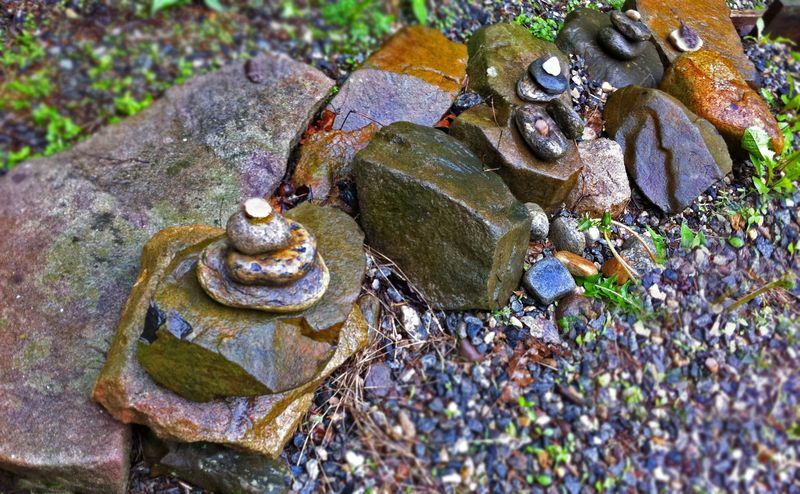 I’ve been stacking stones for some time now—it’s a calming practice that frees up my concentration like a reset button. The piles in this photo are just outside the shop door, but they’re all over the property. Inside, the humidity was better as the climate system struggled to maintain a solid thirty-five percent—the mandated level for optimum building. 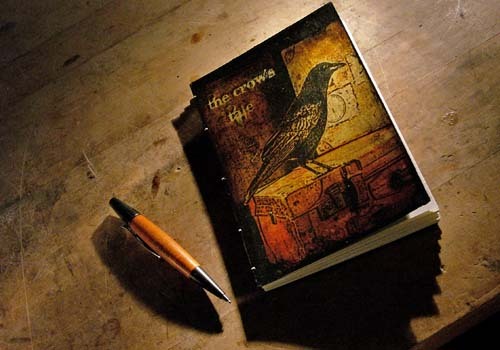 After a strong espresso, I set about making some entries into the journal that accompanies The Crow. 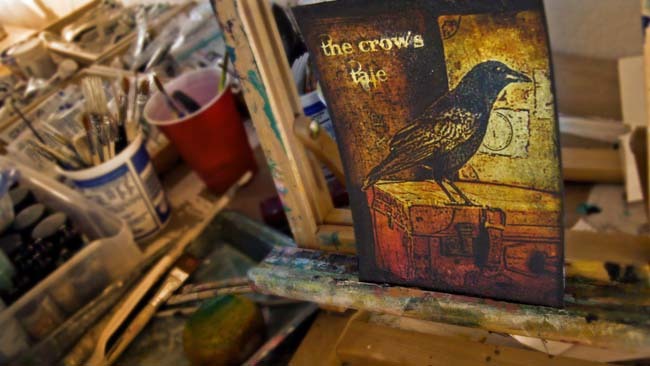 My wife Carla is an artist who makes hand-bound books, so I asked her to construct the journals for my guitars. We share studio space, so it just seemed natural that our projects would overlap. Her beautiful photos and collage images are often seen on this blog as well. Here is her cover painting. 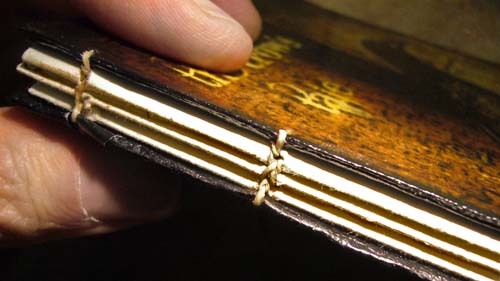 Hand-bound spine of the journal. Archival paper is hand-stitched together to make a one-of-a-kind original that is the companion piece to each instrument I build. This is the entry about the wiring. 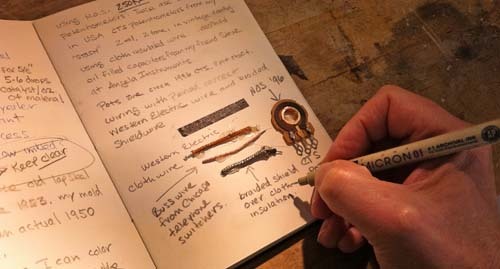 The story of the Western Electric wire and NOS pots from 1996 along with actual samples of the parts are all in the journal. The book tells the story—starts and stops included. 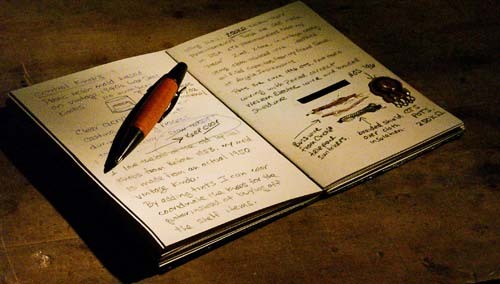 When ideas are born or rejected they are written in there. I let it all spill out and the new owner of the guitar gets the whole thing.